The star-delta transformer shown above is excited on the star side with a balanced,4-wire,3-phase,sinusoidal voltage supply of rated magnitude. The transformer is under no load condition. 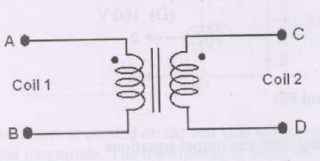 The circuit diagram shows a two-winding, losses transformer with no leakage flux, excited from a current source,i(t),whose waveform is also shown. The transformer has a magnetizing inductance of 400/ πmH. The figure above shows coils 1 and 2, with dot markings as shown, having 4000 and 6000 turns respectively. Both the coils have a rated current of 25A. Coil 1 is excited with single phase, 400V, 50Hz supply. Wound in the horizontal arms means, Area reduces from 20cm2 to 10cm2.... So Inductance will be halved.